Need a new bag? Stop scrolling and look right here – we’re gonna make this real easy for you. 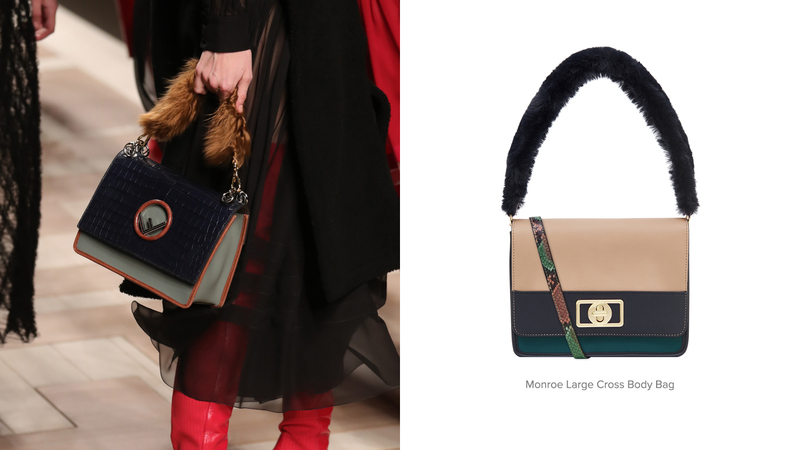 From cool colour blocks to faux fur everything, get to know the three biggest bag trends of AW17, as seen on the catwalks. Your new season inspo has arrived. Colour block bags got a grown-up makeover at Fendi, with muted palettes and glossy metal hardware having found their way onto slim, ladylike styles. Sumptuous fur handles brought an expected twist to these swish new shapes, creating an out-there look that we can’t wait to snap on Insta. Get a slice of the AW17 action with this colour block design in soft pink, navy and teal, featuring a plush handle plus a faux snakeskin strap for versatile wear. Love at first sight? We think so. 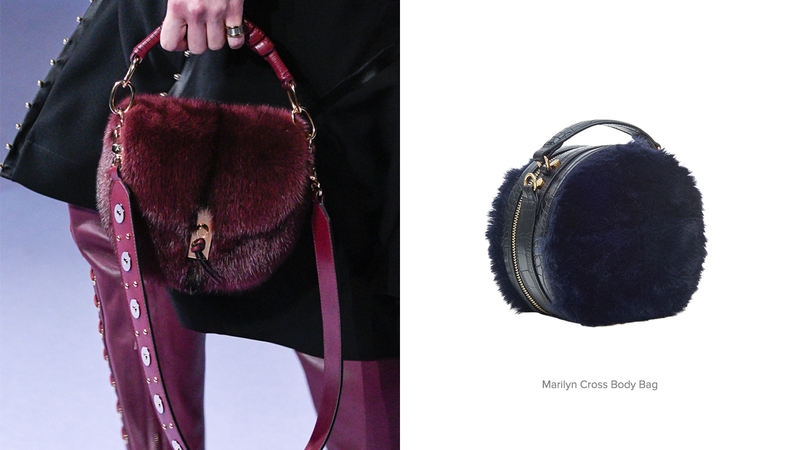 Things got warm and fuzzy over at Altuzarra, with a flurry of fur bags cosying up for the season ahead. From rich jewel tones to natural animal patterns, plush picks emerged as a key trend on the catwalks for AW17, upping the luxe factor in our cold-weather wardrobes. Get involved with this navy cross-body bag in navy faux fur (seriously stroke-able), panelled with mock-croc sides plus a long-shoulder strap to keep you hands-free. Day to dark perfection. 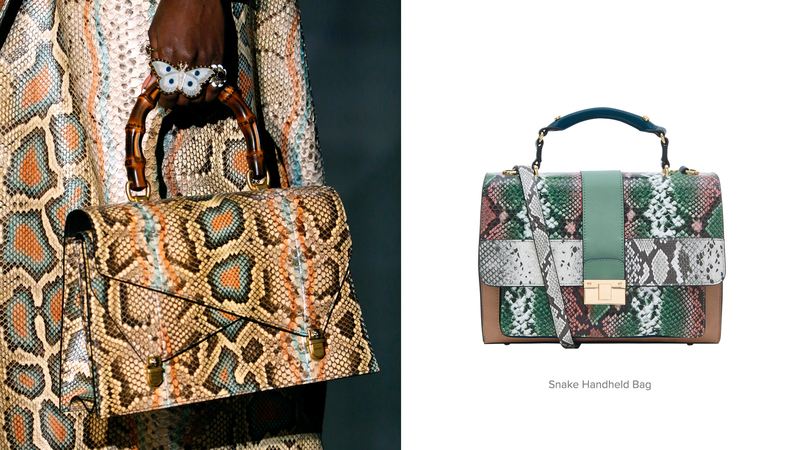 The models at Gucci slithered down the runways with snakeskin bags in hand, proving the trend is back in the most major way. Bringing all the glam-girl vibes to structured shapes, these boxy bags mixed authentic skins with vibrant contrast colours for a cool, directional feel. Wanna wear the stand-out trend of the season? Get your hands on this two-tone snakeskin style, featuring colour block panels, a gold clasp and a swish top handle – aka the ultimate statement-maker of your AW17 wardrobe.